Funded by U.S. National Science Foundation REVSYS grant (DEB-0919333, local link, NSF link) and a Field Museum of Natural History Field Dreams award. Torsten Dikow traveled to Namibia in order to conduct field work primarily in the Namib Desert where the plant and animal life relies on the daily fog from the cold Atlantic Ocean to obtain enough water for survival. The aim of this trip was to collect specimens of Asilidae and Mydidae to be included in the taxonomic and phylogenetic studies of the REVSYS grant. This field trip was funded by both a Field Museum of Natural History Field Dreams award and the NSF REVSYS grant. On the small coastal dunes north of Swakopmund Torsten was able to observe and collect the unique robber-fly species with reduced pulvilli Prytanomyia albida (Oldroyd, 1974) (Asilidae: Laphriinae). This is an exciting discovery as this species was known from very few specimens from the coastal Namib Desert. In addition, the mydid Namibimydas gaerdesi was observed and collected at the mouth of the Swakop River. Prytanomyia albida (Oldroyd, 1974) photographed near Cape Cross on coastal Atlantic Ocean dunes in Namibia (Asilidae: Laphriinae). The most enigmatic plant in the Namib Desert is Welwitschia mirabilis that is related to conifers and considered a living fossil. This species is only found in a narrow coastal strip along the Atlantic Ocean from southern Angola to about Swakopmund in Namibia and was seen at several collecting localities. 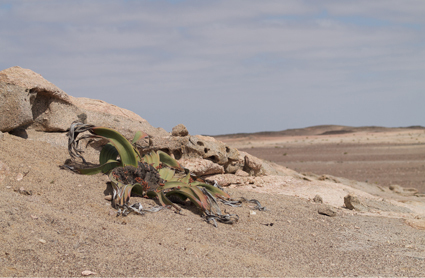 A Welwitschia mirabilis (Welwitschiaceae) photographed near Cape Cross in Namibia. Torsten spent several days at the Gobabeb Training & Research Centre where he explored two different environments near the station on foot. Several Mydidae species are known from the surroundings of the station, but unfortunately none were collected and only Asilidae and Therevidae species were collected. The huge sand dunes on the one hand are the most characteristic environment and contain very specialized plant and animal species. Torsten was able to collect two species of robber flies on the high dunes. The other environment is the Kuiseb River, which is dry for most of the year, but underground water allows large Acacia and fig trees to grow and supports a diversity of animals including many bird species. The Kuiseb River meanders like a green oasis through the Namib Desert and prevents the sand dunes from expanding further north. 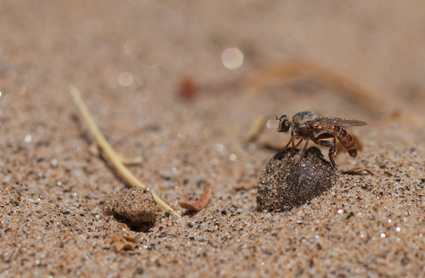 Torsten collected several robber flies in the riverbed among them Trichardis picta shown below. The robber fly Trichardis picta (Asilidae: Laphriinae) in the dry Kuiseb riverbed at Gobabeb. 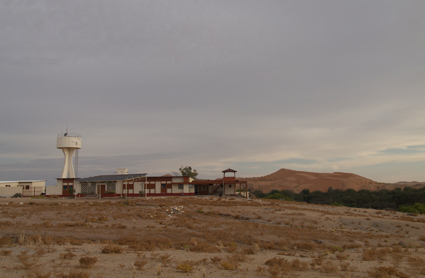 Gobabeb Training & Research Centre with large sand dunes and Kuiseb riverbed in the background. 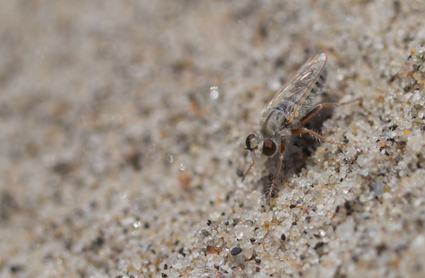 At the eastern edge of the Namib Desert sand dunes in the Namib-Skeleton Coast National Park flies another species of the rare mydas-fly genus Namibimydas was observed and collected. The species is actually a new species, which is currently being described in a manuscript entitled “Review of Namibimydas and Nothomydas with the description of new species”, and which will soon appear in African Invertebrates. Before this field trip this species was only known from two specimens and some eight specimens were collected on the Elim Dune. Unfortunately, I wasn't able to photograph this species in the field because the flies were just flying very fast. The habitat at the Elim Dune can bee seen below. 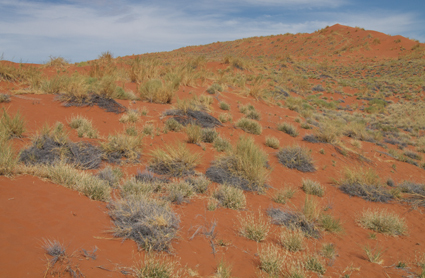 Vegetated Elim Dune in the Namib-Skeleton Coast National Park near Sesriem. Habitat and type locality of a new species of Namibimydas. Overall, some 20 species of Asilidae and 2 species of Mydidae were collected on this very productive field trip to a very remote part of the world.